Activision is reportedly pulling videos of Kurt Cobain performing non-Nirvana songs in Guitar Hero 5 from YouTube, claiming they violate copyright. 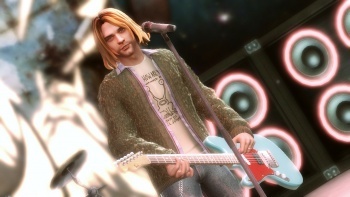 For those who care about such things, the infamous video of Kurt Cobain singing songs by Public Enemy, Bon Jovi, Megadeth and others in GH5 was tantamount to sacrilege and also painted a painfully vivid picture of why so many people were unhappy with Activision's decision to include the former Nirvana frontman as a playable character. Watching Cobain belt out "You Give Love a Bad Name" may or may not be a hilarious spectacle but it's hard to argue regardless of your opinion that it's not in extremely bad taste. That's a tougher call to make now, however, as the video has apparently been pulled from YouTube following a copyright complaint from Activision. YouTube user Corporalgregg3, who originally posted the video, told Kotaku, "My last account was permanently disabled due to (I think) Activision. Right before my account was shut down, the Kurt Cobain vid was removed due to copyright claim by Activision Games Inc."
It's unclear whether this is the only Cobain video Activision has pulled or if the company is going after all videos featuring him performing non-Nirvana material. CVG suggested that all such videos were being removed and an admittedly cursory search of YouTube shows that the vast majority of Cobain trailers online feature Nirvana tracks, but of course that only makes sense, since Cobain and Nirvana are virtually interchangeable. And videos of his avatar covering other material (including a rendition of No Doubt's "Ex-Girlfriend," my personal favorite) are still kicking around. It's a potentially dicey situation because there are literally hundreds of thousands of Guitar Hero videos on YouTube and Activision, as far as I know, has never before shown any interest in them, yet unflattering portrayals of Cobain are apparently bringing down the copyright hammer. Maybe it's a response to Courtney Love's threat to sue the company over its use of Cobain's image, despite her earlier approval? Be that as it may, I'm no expert on the matter but I don't think copyright laws were meant to be wielded quite this selectively. We've asked Activision if it can give us the real skinny on what's happening here, an inquiry I expect will go completely ignored, but if they happen to get back to us on this one we'll be sure to keep you posted.